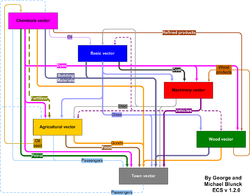 ECS Vectors (by George) define 31 cargoes and 35 industries. Running all of them in one game makes the game rather complicated. To give the player control over the number of cargoes and industries, cargoes and industries are grouped into 6 blocks (Vectors). One of them is the base one, that defines the minimal amount of cargoes and industries, and has two additional functions (adding variable snow lines and removing default industries), which are optional. 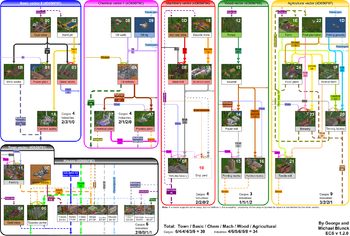 Special houses of the ECS Town Vector are represented in a separate GRF ECS Houses. 5 of them are additional ones. They can be used in any combination, with the ECS Town Vector or independently. 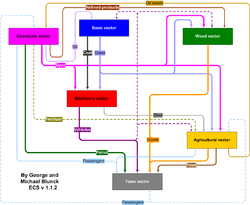 Every vector disables the default industries, which are similar to the industries, represented in the vector. 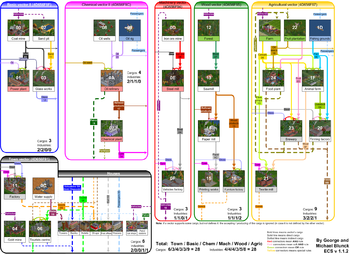 This page was last modified on 25 January 2013, at 17:20.